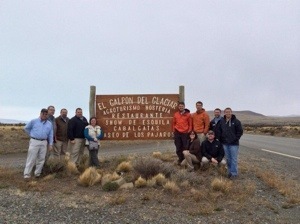 VALOR’s Patagonian Steppe excursion included a stop by the estancia of El Galpon del Glaciar. 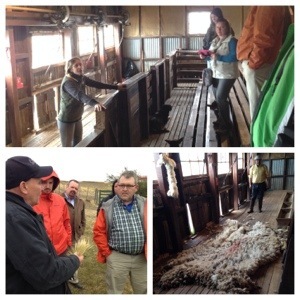 Ranch manager Marcos and his partner Mary took us through their operation, that included sheep and wool production, a restaurant, Patagonia Steppe excursions, and agrotourism. The operation began in 1912, in what was then an even more remote part of the world. Argentina is the world’s 3rd largest wool producer, behind only Australia and New Zealand. The “Steppe” offers a rough terrain for livestock, with annual rainfall under 2 inches and tough native grasses. It takes nearly 7 1/2 acres of grazing land to provide enough food for one sheep. Compare that to nearly 3 sheep per acre in the more lush Buenos Aires province. Many of the estancias on the Steppe are very large in size to make up for the tough grazing. Some ranches reach over 200,000 acres to accommodate their flocks. The tough grasses are also hard on a sheep’s teeth, making it hard for the sheep to graze for more than 6-7 years. El Galpon del Glaciar’s land covers over 35,000 acres, including some more lush mountainsides, that receive winter snows. The estancia raises approximately 7,000 Corriedale and Merino breed sheep. The Corriedales make up the majority of the flock. They are preferred because of their ability to handle the harsh conditions, while still producing fine wool. One ranch-hand can care for up to 12,000 acres of grazing land and the animals that graze it. El Galpon’s operators are proud to train and utilize Australian Kelpie dogs as well as gauchos on horse-back to manage and herd the sheep. 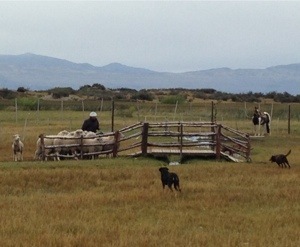 The estancia even provides demonstrations on the smaller portion of their land that surrounds the restaurant. The sheep are sheared using a British machine that has changed little from it’s original design. Using a crew of 30-40 contracted workers, Up to 10 sheep can be sheared at a time. Each shearer can handle as many as 200 sheep per day during Patagonia’s traditional shearing time of December. 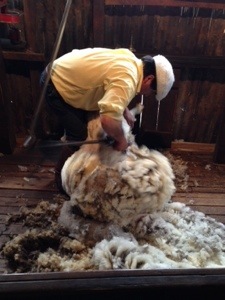 The fibers of the Corriedale sheep can be as long as 9-10 inches, and the fleece is removed as one piece, in approximately 2 1/2 minutes by a professional. The wool is graded by professionals, then packed into 200 Kilogram, bales. Wool is then sold to washing factories in another province for processing and sales. In the beginning days of the farm, ranch-hands would travel over 300 kilometers on horse-drawn wagons to deliver the bales to a port during the winter. They would return with metal, lumber, and supplies to build new barns and structures. The ranch also sells an average of 3,000 sheep per year for meat production, while keeping 2,000 replacements for the flock. El Galpon added the restaurant and seating in the shearing room in 1996 to increase their ability to attract tourists that come to see the Patagonian ice fields and the Perito Moreno glacier. The estancia lies on the road between El Calafate and the entrance to the National Park. The Argentinian Institute of Agricultural Technology is researching new methods for growing traditional field crops in the Steppe. Though initial results are promising, it will be expensive for farmers to make large scale production work, specifically in providing the large quantities of water needed to sustain most crops. 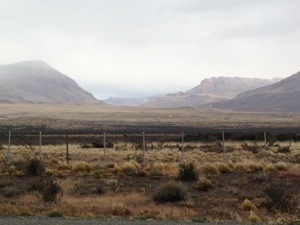 The remote areas of the Patagonian Steppe are not provided with electricity, providing the need for businesses such as El Galpon to create their own power at great expense. Marco and Mary have made several visits to the US to research other operations and look at ways to improve their farm. It was obvious during our visit that El Galpon del Glaciar is being run by people with a passion for agriculture, their animals, and the land. The VALOR fellows were honored to be able to learn from our visit. Tomorrow we head north, approximately 3,000 miles to the warm weather and waterfalls of Iguazu!